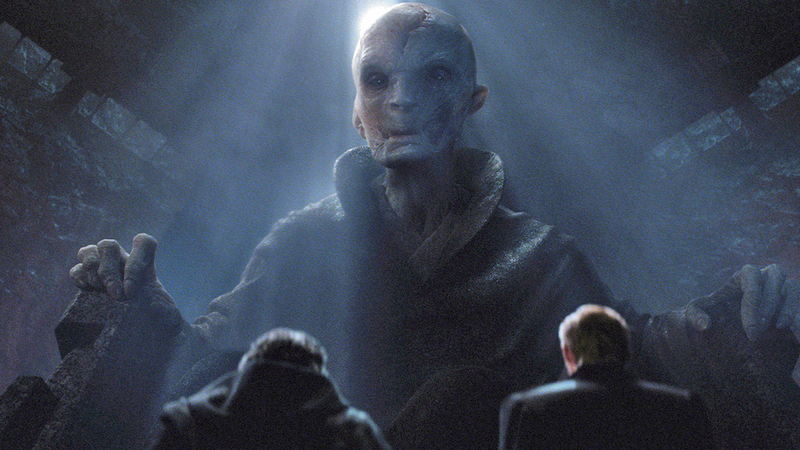 Supreme Leader Snoke is an intimidating figure when we first saw him in Star Wars: The Force Awakens. He was definitely imposing, partly thanks to hologram technology, where he towered over Kylo Ren (Adam Driver) and General Hux (Domhnall Gleeson). There’s a lot of mystery surrounding the villainous leader including whether or not he’s actually Darth Plagueis. Andy Serkis has mentioned before that he has rejected the theory. Fans have also been wondering about Snoke’s height. Is he the size of Yoda, or is he as tall as a Wookiee? Well, a new photo featuring the Snoke figure from Star Wars: The Last Jedi has been released, and it gives us a sense of his size. If we’re to assume that his praetorian guards have the height of a normal human, that would mean Supreme Leader Snoke would be very tall, possibly standing 8′ tall. Check him out below. The figure is part of the BB-8 playset that includes two figures, Supreme Leader Snoke and a praetorian guard. The film is written and directed by Rian Johnson (Looper, Brick) and stars Mark Hamill, Carrie Fisher, Adam Driver, Daisy Ridley, John Boyega, Oscar Isaac, Lupita Nyong’o, Domhnall Gleeson, Anthony Daniels, Gwendoline Christie, Andy Serkis, Benicio Del Toro, Laura Dern, and Kelly Marie Tran.